– The Kingdom of Maharlika was composed of the Philippines, Danang Vietnam, Hong Kong, Taiwan, Kuril Islands, Borneo, Guam, Marianas Island and Hawaii, and was ruled by a certain King Luisong Tagean [later changed to Tallano for fear of Spanish execution]. He ruled the entire kingdom from Luzon, the Northern part of what is now known as The Philippines. This claim is supported by surveys made as early as 9th century, acknowledged by British monarchy in 14th century. However, court documents, land title OCT No. T-01-4, indicate the Tagean [Tallano] Clan only owns the whole Philippine archipelago, but ignored the other parts of the Maharlikan Kingdom, i.e. Sabah Borneo, Marianas Is. , Guam and Hawaii — an early attempt of a major land grab by the British and other colonialists. Even in the 1935 Philippine Constitution, the number of islands were further reduced from 7,169 to 7,100 only, by the oligarch controlled legislative. With reference to the map below, even the shorelines where cut-off, a clear indication of willful distortion of historical dominion further eroding the integrity of the Land Registration Authority and the whole sovereignty of the Maharlikans. Before we continue on exploring the bits and pieces of our forgotten yet glorious past, please allow us to share our sincere insights on the issue of sovereignty and the importance of enlightened unity among the inhabitants of these islands our long departed ancestors dearly called Maharlika. The possibility of unity among Maharlikans depend largely on their ability to go beyond their religious differences. Both Christians and Muslims need to trace their roots before they were indoctrinated to monotheism. The worship of Nature is saner than idolatry. Before Islam and Christianity came, we as a people were very spiritual and consciously connected to the spirits of our ancestors and Nature herself. Research if you may, the first version of Qur’an was written in Latin, just like the Bible. Why? Both were made by the same authors at the Vatican. The purpose of having too many religions is to divide and conquer the entire global population. We can all be spiritual but not religious, social conscious but apolitical. Religion has nothing to do with Spirituality. Its purpose is to control the Mind through hypnotism. Constant repetition of the Lie makes the dogmas more believable — that’s a known effective method of indoctrination, i.e. brainwashing. And if ever you still consider yourself a free individual, know that you are working for the Corporation known as the Government of the Republic of the Philippines. Periodic national and local elections are put there to create the illusion of freedom and yet nothing has happened since this Corporate Republic has been established in 1946. The future is accelerating towards the destruction of medieval empires, borders and national identities. Ultimately, the integrity of the individual and the Sanctity of the Soul will triumph over the Slave Mind, in the spirit of Universal Enlightenment. Please allow extra time for larger files to download. Wikipedia’s distorted account of Maharlika, which is also what grade schools are peddling can be read here. “Asalamu Alaikum, Warahmatulahi Wabarakatuhu” Maharlika was a Kingdom of Royal Nobilities wherein its rulers were of bloodlines of the Holy Prophet.In the 9th to the 12th century with India’s Majapahit Empire of Maharaja Pamarwasa, the latter’s suzerainty upon the territories also referred to as the Sri Vigaya Empire, a Satellite Empire of the Majapahit’s, under a kinship, King Luisong Tagean Tallano, comprising of Selurong-Luzon, Vigaya-Visayas, Maguindanao-Mindanao, Sulook-Sulu, Malayas-Malaysia, Bulongan-Brunei, Johore-Singapore and extending eastward to Ladrones-Guam, Carolines Islands and Havvaii-Hawaii. The people’s religion was Hindu as State religion however there were others as, Sankhrit, and perhaps even Buddism. Rest assured that its rulers were Muslims. Evident when the Sri Vigaya Empire diminished, the territories embraced the religion of Islam. The King was referred to by Italian Traders as “Tallano”. The King’s sons were Raja Sulayman of Selurong, Raja Humabon of Vigaya, Aliwya of Maguindanao, a kinship Makdum of Soolok, son Panglima Ege(Kaliph Pulaka or Datu Pula, better known in Cebu as Lapulapu) of Sempurna Malayas, His cousin in-law, an Arab, Zein Ul-Abidin of  Seri-Brunei, Sharif Kabungsuwan(Karim Ul-Makdum) of  Johore-Singapore and Indonesia and territories  extending eastward to Guam, Carolines and on to a kinship-King Kamehameha of Havvaii. These Kinships were the ruling class family of the Maharlika Kingdom. The death of the Majapahit Emperor-Maharaja Pamarwasa in the 12th century, the Empire began to diminish and so did its Satellite Empire, the Sri Vigaya Empire. The Seri Ruler, an Arab, Zein Ul-Abidin whose wife-Eskander was the daughter of the Majapahit King, took his father in-law’s political authority and established the very first Sultanate of Bruney as Sultan Mohamad Shah. He had also went to Sulu to have succeeded Raja Baginda Ali, the latter being the son in-law of Ruler Paduka Batara, the Eastern King of Sulu who had passed away in Fuikein, China. Other rulers of the said territories also established strings of Muslim Kingdoms, then known as the Muslim National Archipelago. 1521 Spanish encroachment and colonization into Selurong, King Luisong did not agree of Spain’s colonization/atrocities naming his kingdom as the Philippines, after Spain’s King Philip-II, and consorted with the Queen of Spain, however to no amicability reach. King Luisong Tagean Tallano then consorted with the British who defeated the Spanish and the former in 1764 issued a British Royal Protocol Decree 01-4 favoring the ownership of said territories to the said King. When the British left, America in competing for colonization with Spain, supposedly bombed its own naval vessel, the USS Maine docked at Spanish colonized Cuba and blamed Spain for it as being an act of War. As restitution, Spain signed a treaty to have ceded the Philippines to America for 20 Million in Gold Coins in the Treaty of Paris of December 10, 1898 officially Spain ceding the Philippines, Guam and Puerto Rico to America tacitly agreed by with the King’s kinship, Don Benito Tallano who was handed the amount in paying Spain and to have Spain Issued the “Titulo De Compra” as by the Torren’s System as Original Certificate of Title or OCT 01-4  based on the Maura Law, the very first ever issued by Spain in the Philippines; affirming ownership of the Philippines to Prince Lacan Acuna  Ul-Rijal Tagean Bolkiah-Tallano. Wherein, the Prince took on the name Bolkiah then under his uncle the Brunei Sultan-Hasan Bolkiah, who had suzerainty upon the said territories known as the “Singing Captain”. While his cousin, son of Raja Lakandula, San Agustin De Legaspi was reigning in Manilad, Selurong. Sultan Bolkiah’s elder brother was Sultan Ahmad, the second reigning Sultan of Brunei who was succeeded by his nephew Sultan Seri Ali. Seri Ali was succeeded by Sultan Hasan Bolkiah, then Succeeded By Sultan Ul-Rijal. Sultan Ahmad who begotted Amir Alatas Uddin, the latter being the father of Sayyid Nakhoda Perkasa Angging and Nakhoda Sangkalang. Angging in 1704 was Brunei’s Maharaja for the Sulus (begotted Maharaj Adinda Taup who Begotted Sharif Imam Ul-Alam Arpa Who then Begotted Sharif Carpenter Arpa to Ashrf Paduka Ahmad Carpenter Arpa-V), and Nakhoda Sangkalang for North Borneo later after the two defended North Borneo along with Sulu warriors for the Brunei Sultan against the self proclaimed Sultan Mobin at North Borneo in 1613. 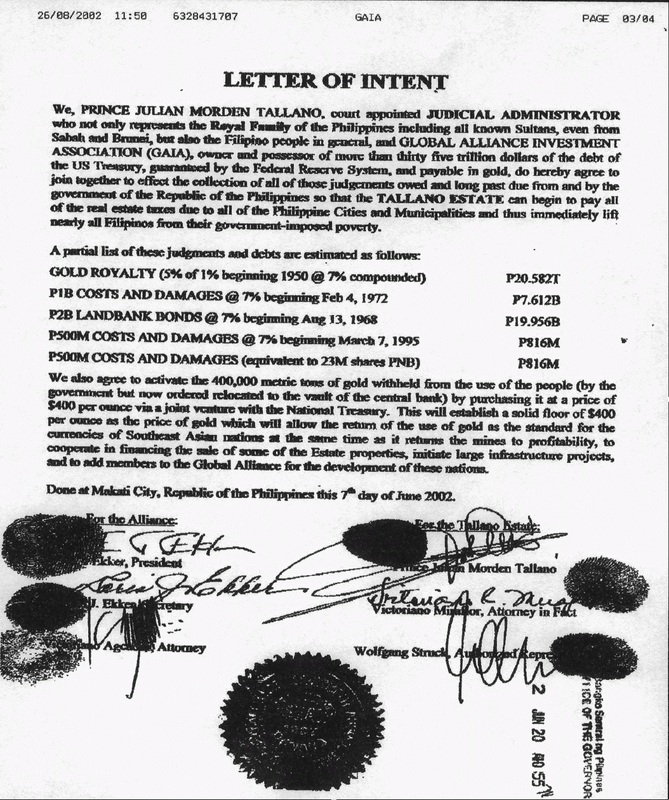 America paying 20Million in Gold Coins were handed over thru Don Benito Tallano who paid Spain for as well the Titulo De Compra later subdividing Luzon to other kinships, and recognition of Prince Lacan Acuna Ul-Rijal Tagean Bolkiah Tallano as owner of the Philippines as by affirmed by Spain based on the Maura Law in the Original Certificate of Title OCT 01-4 the very first land Title issued in the Philippines. Since the OCT 01-4 only covered the Philippines, the rest of the territories fell upon foreign administering powers who had later made said territories divided as independent sovereign States. America concurred the ownership of the Philippines as well later in October 3, 1904 under U.S. ACT no. 496 Torrens Title that was also declared as OCT 01-4 as by the Torrens System. In 1913, U.S. Act no. 2259 affirming the Title OCT 01-4 of heir owners of fee simple and heirs/Princes of interest to their predecessors of Maharlika Kingdom, as registered. The Title of ownership to the heirs were farther substantiated and certified thru court certification, “Return of Sheriff” under Philippine Court. The court In January 19, 1976 made judgment with final and executory decision in favor to Prince Luis Morden Tallano and/or heirs due to non-appearance of any claimant nor the appearance in court by the Philippine Government. However, a court appeal was made under CA-GR no. 70014 by the Government declaring OCT 01-4 as null and void. Final decision is pending for Resolution. Whenever and whatever resolution-decision may be, it may affect the validity of both parties. 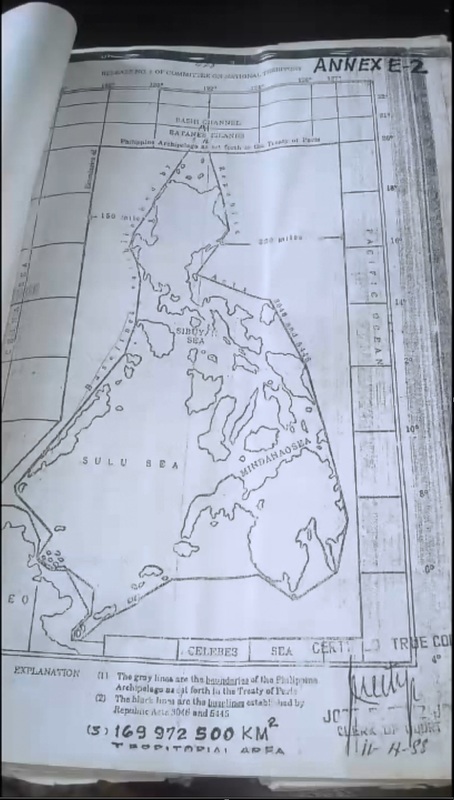 Philippine Republic, land titles are based on a “deed of Absolute Sale” and as by the Torrens System, and so is the OCT 01-4 also as by the Torrens System, and vice-versa to Philippine land Titles of its citizens. Although, no other Titles were issued prior to OCT 01-4, Title issued as by same Torrens System, is contradictory of the Torren’s System. It is so, because the Torrens Title is indefeasible and can not be voided by any land claimant who has no Title or whose Title is issued later; and is imprescriptibly or unsubscribed. As by the OCT 01-4, the initial mother Title issued upon the cadastral delimited territory of Maharlika for the Philippine archipelago, its case is likely be pending indefinitely for protection of all parties, apparently. The Present heirs and/or heirs of interest are assisting the homeless using OCT 01-4 as its legal basis against Government administrations that moves out the homeless from so called government lands without compensation nor relocation. Prince Morden Tallano of the Tallano Foundation or the TALA ESTATES is the Selurong Base who had spearheaded our proprietary rights and claim; and Am Prince/heir of interest of OCT 01-4 or Original Certificate of Title o1-4 and stands for all its Tribal Affairs as its Plenipotentiary Minister.Insha’Allah. Wa Billahi Tawfiq Wal-Hidaya, Wassalamu Alaikum Warahmatulaah. I am, H.R.H. Al-Sharif (Ashrf) Paduka Ahmad Ulrijal Tagean Bolki Carpenter Yu Tiamo Arpa-V Ibni Maharaja Adinda Taup Angging (Anddin) Zein Ul-Abidin ULRijal Bolkiah Tagean Al-Marhum Sultan Shariful Hashim Abu’Bkr Mohamad Shah of the Maharlika Sultanates. and for PRINCE LUIS MORDEN TALLANO. February 23, 2017 in HIDDEN HISTORY: Advanced Ancient Civilizations.